The EVERGROW IT AquaOcean LED Lighting System is specically designed for lighting freshwater and marine aquariums. The channels have been updated from IT-W 3 channels to 6 channels. For the first time we can now mix 3W&5W CREE&OSRAM&Semi led. It can be easily adapted to any standard size aquarims. The system includes an adjustable bracket which can be adjusted to the Height/ length of standard size aquariums, simply put the LED on your tank and turn it on. The directional nature of the LEDs ensures 100% of the light is pointed downwards so no reflective material is needed. The low heat emission also eliminates the need for ducting and heat exhaust fans. Make use of the pure LED light and suitable for the coral growing, which will make the You can save 50%-90% power comparing with the High Pressure Sodium and fluorescent lamps. 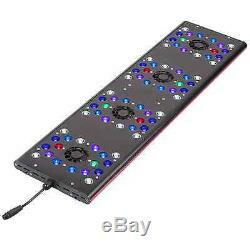 Programmable 230 watt Full Spectrum LED aquarium lights. LCD Display on the remote control. Mixing 3w and 5w LEDs. Remote Control within 5 meters. Special LED configurations for different coral growth. Cree, Osram and Semi LEDs. 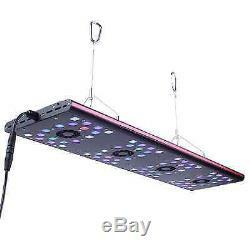 Can be used with any indoor growing method - hydroponics, aeroponics, soil. 4 quiet fans underneath run against heat. 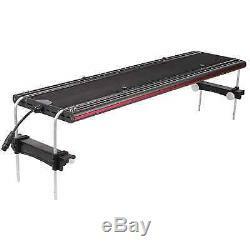 No need for additional cooling equipment, ballasts or reflectors. Integrated hanging kit - very easy to hang. Brackets included to sit on tank. Safe to operate - no risk of fire, burns or exploding bulbs. Produce less heat, less than 10ºC-12ºC tempareture rise. 80%more energy efficicient Metal Halide or HPS lamps-Drastically reduce your electric bill. 50,000+ hour life cycle. Dimensions 80x21.5x2.5 cm. Hyper Red: 4 Osram (3W). Green: 4 Cree XPE (3W). Deep Blue: 16 Cree XTE (5W). Cool White: 20 Cree XTE (5W). Blue: 16 Cree XPE (3W). The item "NEW EVERGROW IT5080 AquaOcean LED Lighting, WiFi, Programmable, Marine Reef" is in sale since Friday, February 24, 2017. This item is in the category "Pet Supplies\Fish & Aquarium\Lighting & Hoods". The seller is "marinefarm_uk" and is located in Oakham, Rutland. This item can be shipped to United Kingdom, to Austria, to Belgium, BG, HR, CY, CZ, DK, EE, FI, to France, to Germany, GR, HU, to Ireland, to Italy, LV, LT, LU, MT, to Netherlands, PL, PT, RO, SK, SI, to Spain, SE, to Australia, to United States, RU, to Canada, to Japan, to New Zealand, to China, IL, to Hong Kong, NO, ID, MY, to Mexico, SG, KR, to Switzerland, to Taiwan, TH.